If you'd like to give the gift of an art workshop or part of an art workshop to a loved one for a special occasion we can arrange a gift certificate to suit your requirements. Send us an email via Contact Us and we can custom build a gift certificate for your loved one. Each certificate is individually numbered and can be for a specific workshop or simply for an amount of money which can be specified on the certificate or not as you like. Gift Certificates will only be issued when payment in full has been received into the nominated account. Gift Certificates may only be redeemed for an art workshop (or part thereof) within the time period specified on the certificate (usually 2 years). Gift Certificates are not redeemable for cash or any other consideration are not refundable. Gift Certificates are only transferable to a person other than the person nominated on them with permission from the issuing body 'Alison's Art Workshops at Jervis Bay. This permission will not be withheld unreasonably. Gift Certificates do not guarantee a place on a particular workshop - this must be booked with Alison's Art Workshops at Jervis Bay through the normal processes, however priority will be given to gift certificate holders if possible. 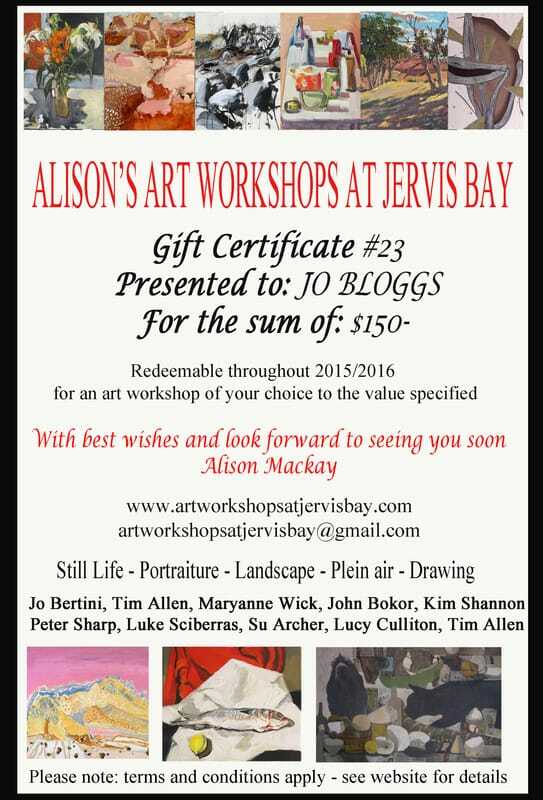 Gift Certificates will be presented by email and must be re-presented to Alison's Art Workshops at Jervis Bay to be redeemed. Alison's Art Workshops at Jervis Bay does not guarantee that all the teaching artists mentioned on the gift certificate will be teaching in that particular year. If you wish to attend a workshop taught by a specific teacher please check with Alison's Art Workshops at Jervis Bay to find out if they will be teaching in the year(s) covered by the gift certificate. In the event of any dispute, the decision of Alison's Art Workshops at Jervis Bay is final. Alison's Art Workshops at Jervis Bay reserves the right to amend these terms and conditions without prior notice.